Elegant sofa - convertible into a double bed. version with 4-legged base. As addition to the model RIGA, RIGA-XL is the perfect symbiosis of sitting, relaxing and sleeping. By simply folding down the armrests, swivelling the single seats and adjusting the backrests arise harmonious and individual living positions. The XLversion of the model also offers the option of a single or double bed. Legs made of wood or metal or optionally as metal slides. 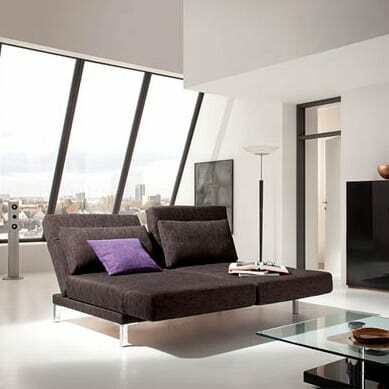 Also available with a depth of 105 cm as relax sofa Riga, without bed-function. Do you have a question about "Riga XL"? How can we contact you?